Cattaneo Commercial are pleased to confirm the successful letting of the former Ebenezer Hall on Cedar Road, Cobham. 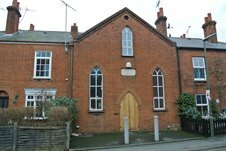 This attractive period building provides good quality self contained offices with a garden courtyard and on site parking. Occupier demand in the office market remains strong and if you have a building for sale or to let please call either Adam Soliman (adam@cattaneo-commercial.co.uk) or Andy Armiger (andy@cattaneo-commercial.co.uk) on 020 8546 2166 and we would be pleased to discuss how we can assist you with a successful disposal.